I think I can safely say that Formosa Tea House is the only restaurant in Newfoundland and Labrador with a manual badminton racket stringing machine. Of course, I didn’t have a clue what it was when I spotted it inconspicuously situated to the side of Formosa’s counter. But, it was a sure bet, I thought, that it didn’t have a culinary or food service purpose. After viewing so many professional kitchens, even with today’s more modernist gear, like centrifuges, immersion circulators and dehydrators, it’s not hard to spot an interloper. Besides, it looked far too new and utilitarian to be just an interesting conversation piece. Speaking of modernist cooking, Formosa Tea House and its next-door neighbour, Loong Wah, are anything but newfangled. Most food processing at Formosa is likely done by a sharp knife, not a Robot-Coupe. According to Chien Ming Yeh, Formosa’s food is much like you’d find at Shilin Market’s stalls in Taiwan. Shilin Night Market, Taipei, Taiwan, is that country’s most famous market and has been in operation for over 100 years. Neither does Formosa look modern or polished. I suspect the well-worn flooring and overhead fluorescent tube lights were in place when the venue housed Parsons Drug Store, followed by a hair salon, and, finally, a tattoo parlour. 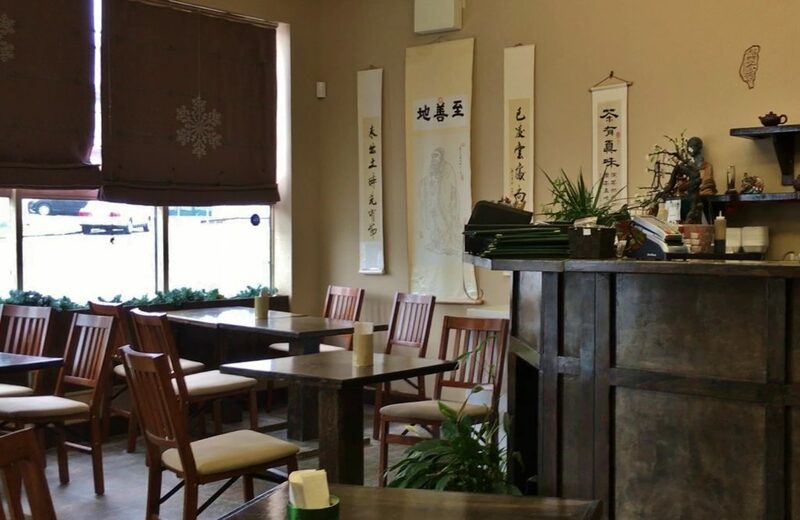 Despite low budget decorating, Formosa has managed to create an atmosphere with some appeal. For example, wall hangings feature the Taiwanese language; characters are also painted directly on the walls. Shelves feature teapots, jars of loose tea – rooibos, jasmine, green, oolong and beauty – corpulent and thin buddhas, smiling and non-smiling. By the front entrance a board is filled with colourful vacation photos – a nice homey touch – and at the back of the restaurant you’ll find packaged dry noodles and DVD’s for sale. 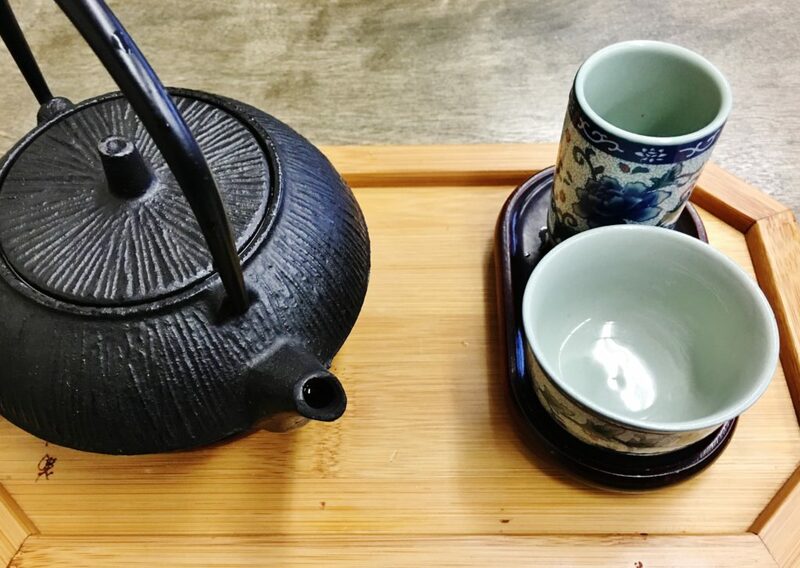 Formosa has a wide selection of hot and cold teas. We poured jasmine, very clear, very clean on the palate. Then it was time to tuck into a plate of crystal skinned, fried dumplings. The sticky critters looked like a passel of invertebrates. Fortunately, since Formosa is a vegetarian and vegan establishment, they tasted like shitake mushrooms and savoy cabbage in a thin flour wrapper. 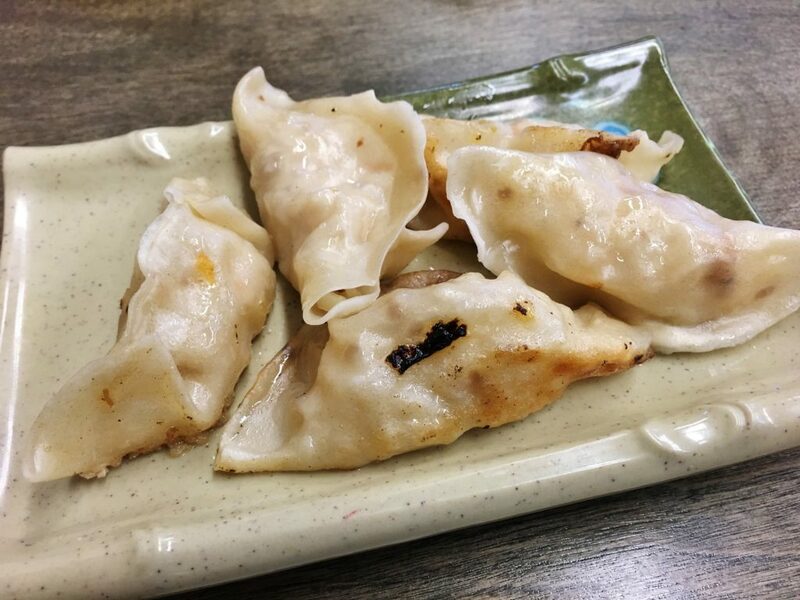 Formosa’s dumplings would have benefited from a little more mushroom and ginger. 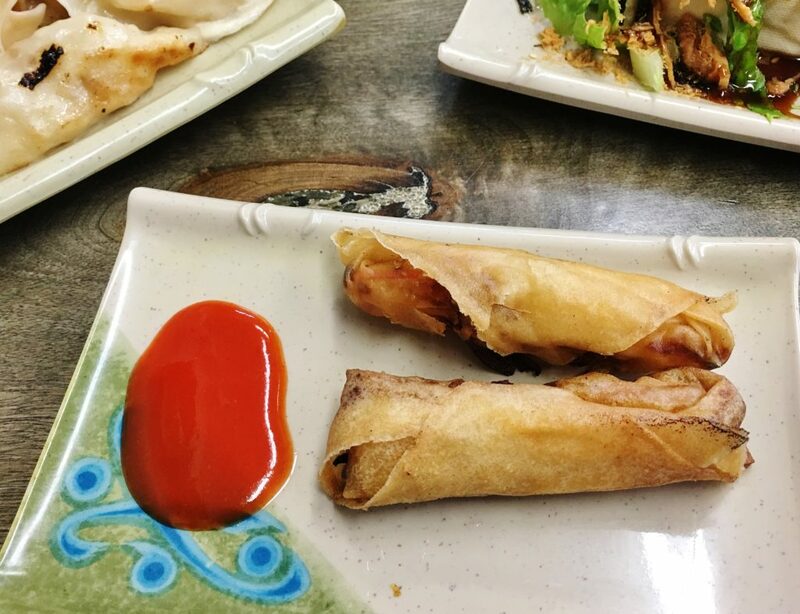 The spring rolls looked artisanal or hand made, exhibiting the slight imperfections of something made manually. Such foods come with the inherent, if unspoken, promise that they will taste better than anything made by a machine. Formosa’s did. A puddle of sweet, plummy sauce that looked like red nail varnish helped. The spicy Hongshao soup had the earthy complexity that comes from something that’s spent time on a low stove. 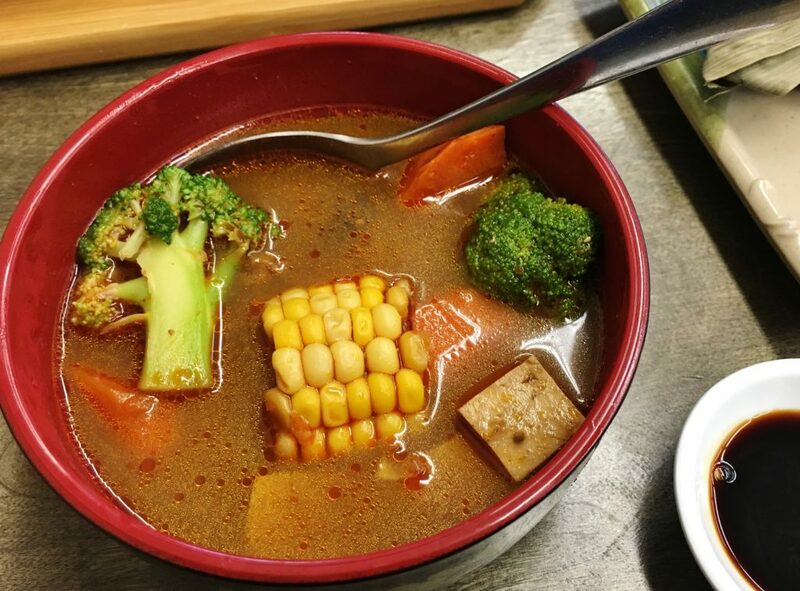 An eye-catching piece of yellow cob corn was surrounded by broccoli florets, mushrooms and cubed tofu. It was a well-made soup. Formosa’s plate of seasonal fried veggies tasted about as dry as steamed veggies, but were still palatable. The tofu salad supplied more enjoyment. Visually, it was feral, like a Gerald Squires painting or something ripped from the surface of a bog. 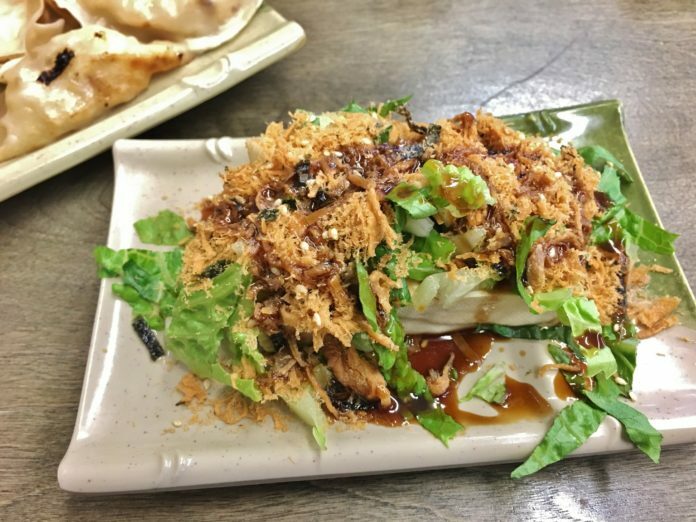 A thick slice of tofu was covered with lettuce, viscous soy sauce and crispy, irregular shaped, tempura-like flakes. It was an outstanding arrangement of textures, accented by the familiar, welcome saltiness of soy sauce. 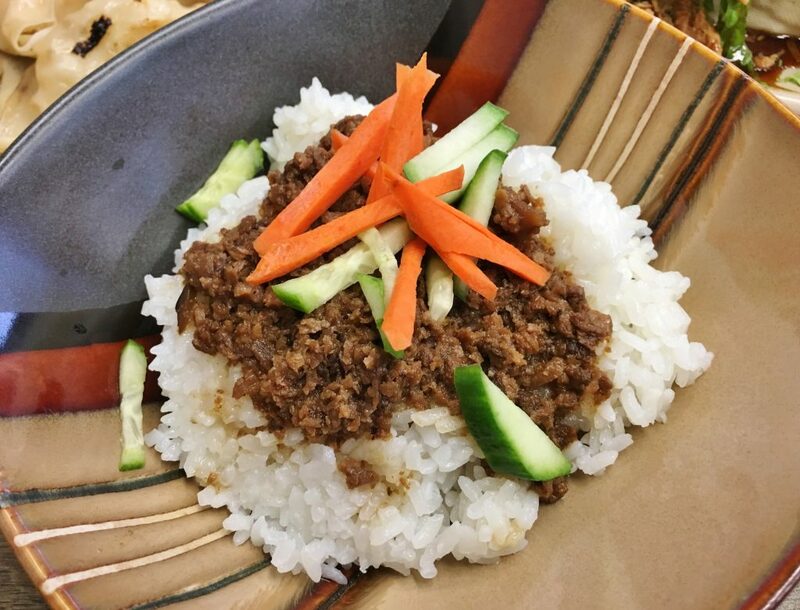 Formosa’s “Formosa Rice” was white sticky rice topped with something that looked like well-browned minced beef. It was a combination of bean curd product, shitake mushrooms and seasonings. Another, equally good but different rice dish, called bamboo rice, came wrapped in a banana leaf. Unwrapped, it looked like haggis. 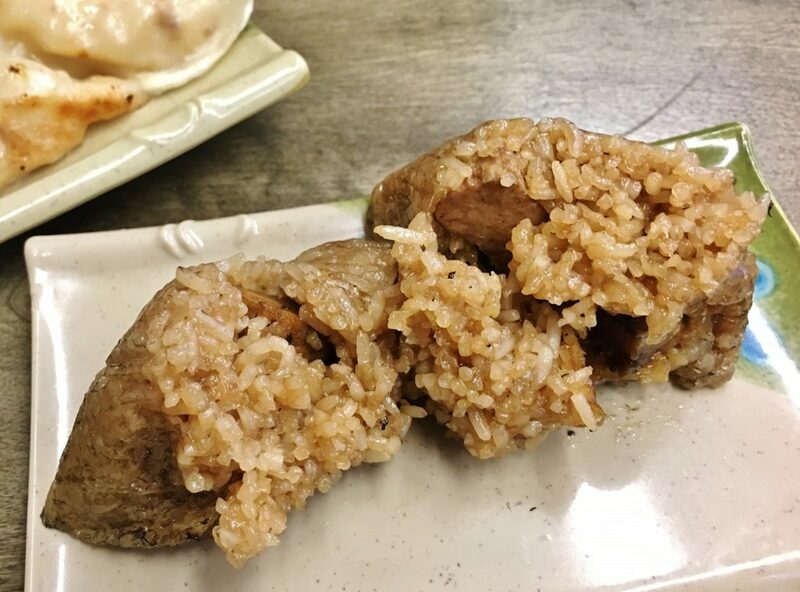 The sticky rice was laced with morsels of veggie ham, gluten and shitake mushrooms. Apart from its texture, much of this dish’s appeal came from a pervasive, yet subtle, taste of caramel. 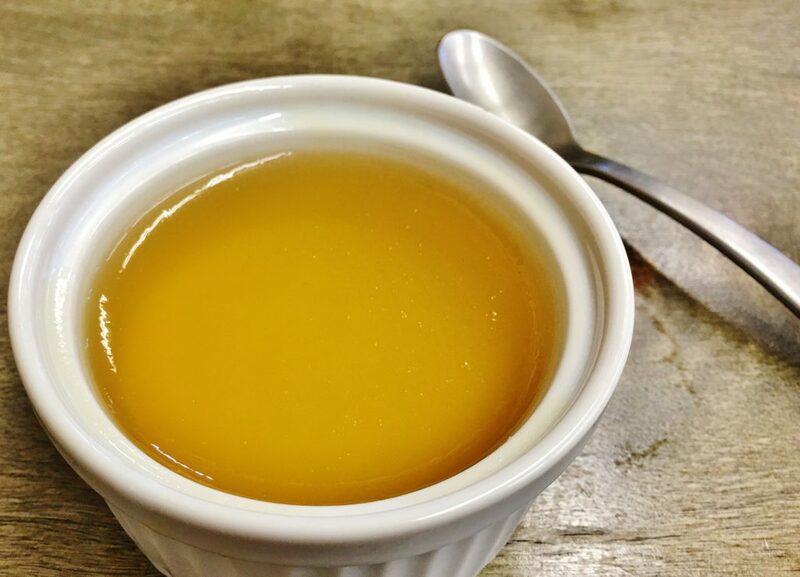 The caboose to this Clickity-Clack Express of dishes was a simple, sweet jasmine jelly. A monochrome dessert: one colour, one texture, one flavour. Sometimes, that’s all you want. Formosa Tea House had created the perfect, refreshing end to our meal. Price Lunch for two with tea, tip and tax costs approximately $30. Service Friendly and very fast. Atmosphere Pleasant and surprisingly cozy. Open Monday to Saturday: 11 a.m. to 6 p.m. Closed Sundays. Beverages A variety of leaf teas, bubble teas, milk teas, coffee, mocha coffee, lemonade, hot chocolate and water. Best bets Spring rolls, Hongshao soup, tofu salad, bamboo rice, jasmine jelly.